Pranayama, the practice of consciously regulating the breath, is one of yoga’s most powerful and effective tools for managing stress, anxiety and fear. Teaching children breath awareness and breath control is one of the most naturally effective ways to encourage relaxation and safely regulate their emotions. We can influence how we feel simply by changing the way we breathe. When we become anxious or fearful, our breath becomes short and shallow. Our sympathetic nervous system responds as if there is an emergency and prepares for “fight or flight.” The chemical-electrical impulses that allow for communication between the limbic system and the neocortex become so overwhelmed that communication shuts down. The neocortex is the portion of the brain involved in higher order thinking skills, such as analysis and evaluation, conscious thought, and reasoning. As a result, it is difficult to think clearly or make decisions; learning becomes impaired. For children who have few previous experiences to learn and draw from, their feelings of safety and security are also impacted. Children are curious about their breath. They play with it, holding it in and out. 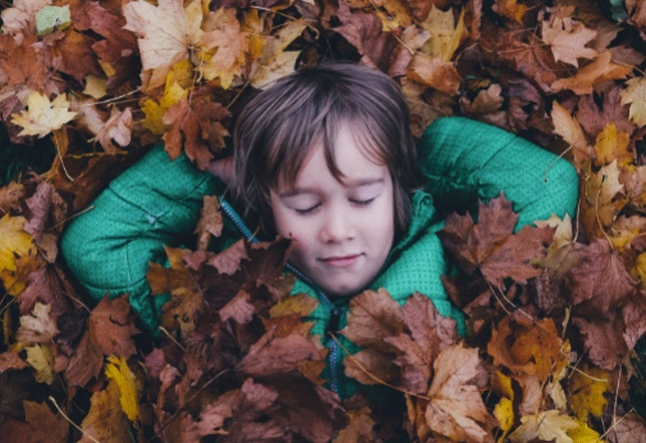 When teaching children breathing exercises, engage their imaginations, make the exercises fun and playful as well as age and developmentally appropriate. The following bhramari pranayama practice has been adapted for children. Bhramari pranayama or the bee breath takes its name from the word for the black Indian bumblebee, bhramari. The adjective bhramarin is Sanskrit for “sweet as honey” or “that which produces ecstasy.” Bhramari describes the characteristic buzzing sound that is produced while exhaling in this breathing exercise. Sit up straight and tall and close your eyes. Imagine that you are sitting in a garden, perhaps under a tree. It could be big; it may be bearing fruit or flowers. Or, perhaps you are sitting by a birdbath watching birds bathe and sun themselves. Look at the flowers in your garden. Do you smell their fragrances? Breathe in their delicate scents. Do you see bees enjoying the flowers too? What sound does a bee make? Practice making that sound: inhale through your nose and exhale a soft “eeee” sound through your mouth, just like the buzzing of a bee. Now, try it again with your lips together (jaw relaxed, teeth slightly separated) as you exhale through your nose. Repeat two, three or four more times. Use your index or middle fingers to plug your ears. Or, plug your ears with your thumbs and place your other four fingers on your head. Or, press the flaps of your ears over to plug your ears. Generally, bhramari pranayama soothes the nerves and calms the mind. For some, practice of bhramari pranayama eases stress and tension, alleviates frustration, anxiety, anger and insomnia. It may also reduce blood pressure. In addition, it strengthens the vocal chords and improves throat ailments. Bhramari pranayama creates vibration in the head. Therefore, some may find this irritating; discontinue the practice if your child becomes irritated. Do not practice if your child has a severe ear infection or epilepsy.